This is a high-quality 13" x 11" x 1/2" thick custom made book inspired by Henry's Storybook with 82 high quality, full color pages of over a dozen classic fairy tales with 52 beautiful illustrations (note: some stories have been shortened and/or abbreviated to match the prop, all 82 pages in this book are printed with stories and full colour stylized illustrations as seen on screen (some are soft focused or pixalized to match the prop correctly). You can also choose our larger 124 page version with 42 blank pages added to the end of the book for use as a scrapbook, photo album, journal or to add your own stories and illustrations! We have included the full original versions of; Little Snow-White by brothers Grimm, Snow-White and Rose Red by Andrew Lang, Maid Maleen, The Gnome, The Paradise of Children by Nathaniel Hawthorne, Hansel & Gretel by Bros. Grimm, Alice's Adventure's in Wonderland by Lewis Carroll, Little Red Riding Hood by Charles Perrault, The Three Little men, The Little Glass Slipper, Rumpelstiltskin as well as beautiful original artwork and additional short or abbreviated stories including: Peter Pan in Kensington Gardens, Pinocchio, Robinhood, a Mid Summer's Night Dream and more! All stories and illustrations are placed in the order they were first shown on screen to be in Henry's book. We have included almost everything shown to be in Henry's book from seasons 1 - 6. This is a large format landscape 13" x 11" size with a high-quality hardcover that is inspired by the book seen on Once Upon A Time. Each book is handmade in Canada on premium thick paper with high-quality finishes and is heavier and much more expensive than the economy papers used in most mass-produced books of lesser value. This is a custom made to order item and it normally takes up to 3 weeks to produce. Please allow sufficient time for production and time for shipping. NOTE: International orders may be subject to customs and/or duty charges if applicable and are the responsibility of the buyer/importer and will be quoted and collected by the courier. Thank you! Beautiful item. A+ transaction! Such an exciting idea, and well executed! Artisan was easy to work with! The packaging and presentation of the book was just incredible! This was a gift for my daughter, and she was in love with it before she even unwrapped all of the charming memorabilia just on the outer wrapping! By the time she carefully undid each charming detail and finally saw what was on the inside, she was amazed! 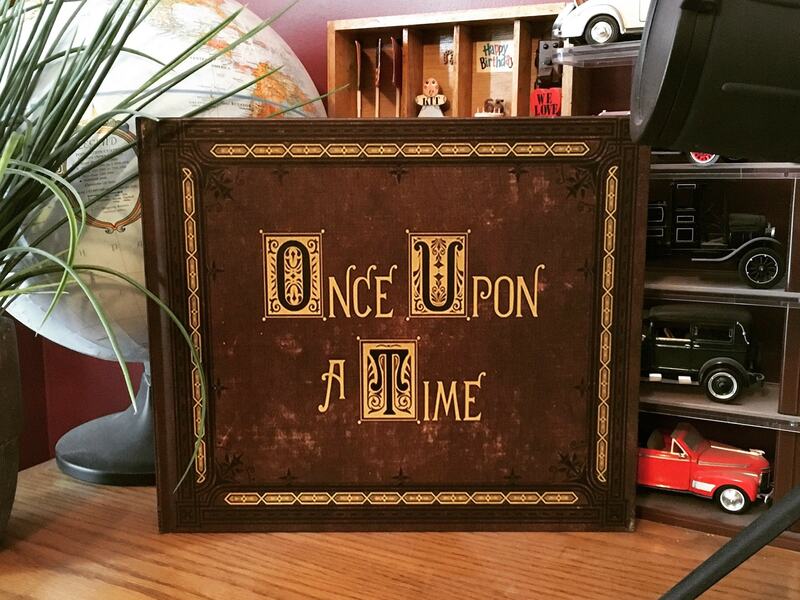 The book is an amazing replica of Henry's, with all of the stories and pictures from the show. I'd highly recommend it to any Once Upon a Time fan! I had constant contact with the seller, and they were extremely helpful with the shipping process. This book was absolutely amazing and the people were so nice to work with! !